Carbonara is a creamy pasta dish loaded with eggs, cheese, and bacon. If there’s anything remotely vegetable-like in the dish, maybe it’s the sprinkle of parsley on top. How on earth can we take a dish like this and make it herbivore friendly? With cashew “egg” cream, mushroom bacon, and zucchini noodles, of course! This recipe is free from meat, dairy, eggs, gluten, soy, and grains… but it’s still creamy and comforting, like any good noodle dish should be! To make the mushroom bacon, slice the mushrooms into 1/8-inch slices. Coat them with olive oil and sprinkle with salt. Place the slices in a single layer on a parchment paper lined baking sheet. Bake for 15-20 minutes until being careful not to burn the mushrooms. Remove from the oven and let cool. 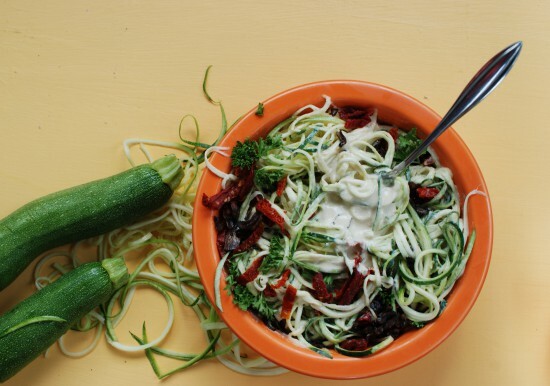 Using a spiralizer, spiralize the zucchini into noodles. Cut the zucchini noodles into shorter noodles if desired. Place the noodles in a serving dish and set aside. In a saute pan, heat the oil over medium heart. Saute the onions and garlic for 5-7 minutes until they are just beginning to brown. Remove from heat and let cool. 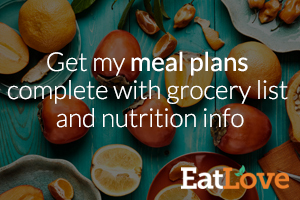 In a blender, blend together the onions, garlic, cahsews, nutritional yeast, and salt with 1 cup of water until completely smooth. Add up to 1/4 cup more water if needed to reach desired consistency. Gently heat the cashew sauce in a pot over medium-low heat. 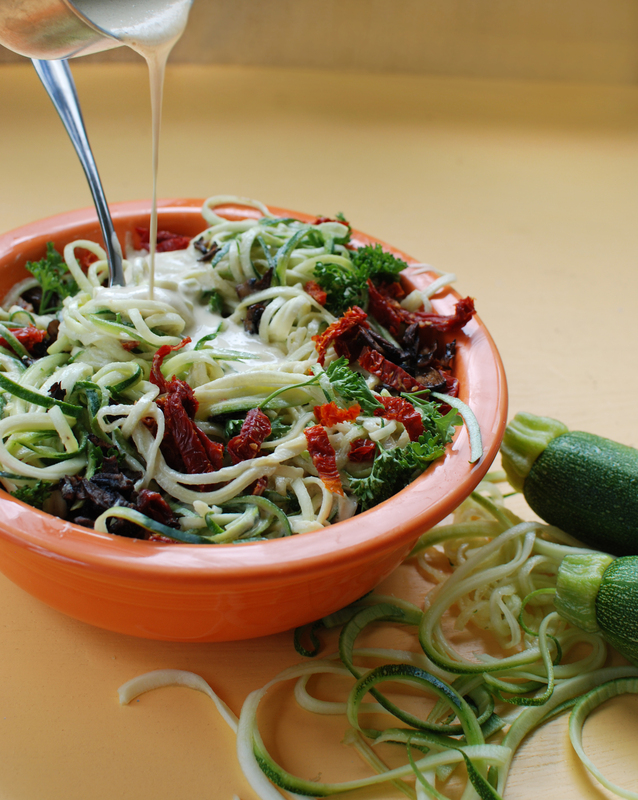 Pour the warm sauce over the zucchini noodles to warm them. Toss the zucchini noodles with mushroom bacon and sundried tomatoes.